2012. It was a cosmic stroke of good luck for the Huntington Botanical Gardens that the same year Clair Marin, their rosarian of 28 years, retired from the venerable institution, Tom Carruth separated from nearby Weeks Roses. As hybridizer of more than 100 roses, including more All-America selections than any other living person, there is simply no one more qualified to shepherd the update of one the most revered gardens in the world than Tom Carruth. 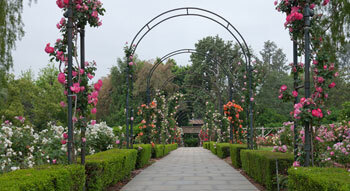 Established in 1908 by William Hertrich as a display garden for the developing Huntington Estate, the three and- a-half acre San Marino rose garden is home to approximately 4000 bushes from nearly 1200 selected cultivars. 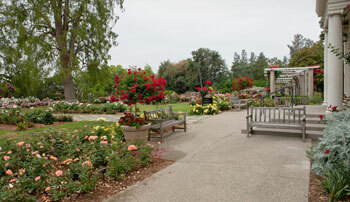 During the 1970’s, the garden was reorganized as a collection garden; the individual plants arranged to trace the development of roses from ancient through modern times. A volunteer at the Huntington for 3 decades, Tom entered his position with strong working relationships, a healthy respect for why the garden is great and fresh ideas on how to build upon past success. Photographing the garden anew, the first flush of Tom’s influence on the historic garden is in a word, spectacular. How this was achieved goes beyond being “blessed with enough money” thanks to the whole of the Huntington Gardens being the recent recipients of $100 million-plus from the estate of the late Frances Brody. The actual plant collection is catalogued and individual plants within beds are freshly assessed. Most are responding nicely to the added attention of the expanding volunteer force. As the garden must stay within the existing footprint, the 700 new beauties blooming now could not be added without roughly 400 bushes being moved or removed. 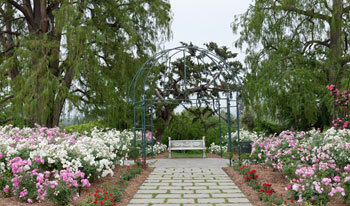 While subtle, the thinning, rearranging and outright additions of newer cultivars enlivens vignettes through viewscapes. Tom organized and prioritized lists of changes to infrastructure and architectural elements. Some changes are unseen: a modern irrigation system, programmed by an iPhone, is replacing the dogged 1930’s pipes. Other changes are respectful of the visual heritage, yet are needed because the weather and the elements rot timber and iron alike. Starting in July, Tom plans to “replace decaying wooden trellises with new structures of extruded aluminum and wood” which appear totally organic in composition, yet are far more indestructible. As the garden’s focus changed in the past, modifications to the educational value of the garden may grace the future. Any broad alterations are subject to collaborative consideration. Perhaps the broadness of historical focus may be tightened to effectively reflect the debt of gratitude the modern rose industry owes California agriculture.